Camping is one of the best ways to experience Grand Canyon’s South Rim. There are three campgrounds on the South Rim, all relatively close to beautiful viewpoints. What’s the best South Rim campground? That depends on what you’re looking for. Often it’s the campground with an available campsite! During peak season in June, July and August, campsites on Grand Canyon’s South Rim can be very hard to come by. If you can’t book a reservation before your trip, you can try to claim one of the park’s first-come, first-served campsites. But plan on arriving at the campground very early. Even in May and September, the best South Rim campgrounds fill up fast on weekends. What are the Best Places to Camp in Grand Canyon? Plan the perfect Grand Canyon camping trip for less than the cost of lunch! With 300+ sites, Mather Campground is the largest and most popular campground on Grand Canyon’s South Rim. Nestled in a lovely ponderosa forest half a mile from the rim, it offers easy access to Grand Canyon Village’s shops, restaurants and popular viewpoints. Grand Canyon’s free shuttle makes regular stops at Mather Campground. The South Rim’s terrific network of paved bike trails also passes by the campground. Due to Mather Campground’s popularity, campsite reservations are required between March 1 and November 30. No walk up or first-come, first-served campsites are available during this time. First-come, first-served camping is available in winter, from December 1 to February 28. Each campsite at Mather Campground accommodates up to six people, three tents and two vehicles or one RV up to 30 feet. Five campsites (120, 121, 128, 172, 185) can accommodate “fifth wheels” up to 30 feet in length. Be aware there are no hook-ups in Mather Campground. Large groups (7 – 50 people) must stay in the tent-only group sites located in Sage Loop. Coin-operated hot showers and laundry are available near the campground entrance. Reservations (required March 1 – November 30) can be made up to six months in advance. Pets are allowed at Mather Campground. But all pets must be kept on a six-foot leash at all times, and they may never be left unattended, even in vehicles. 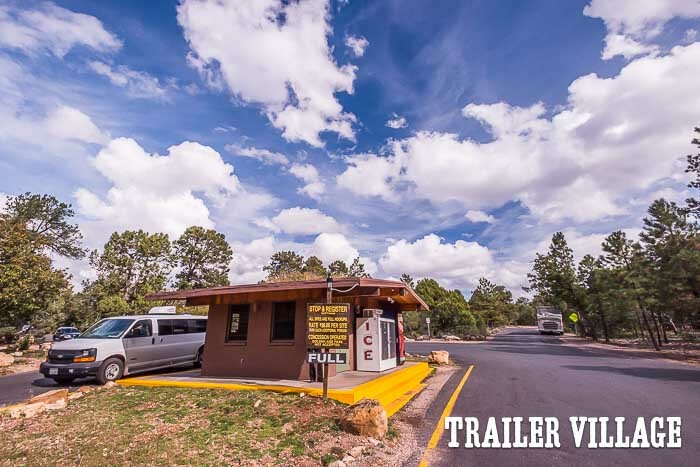 Located next to Mather Campground, this 84-site RV campground offers the only full hook-ups in Grand Canyon National Park. It accommodates vehicles up to 50 feet in length. All sites offer a picnic table, barbecue grill, 30 and 50 amp electrical service hook-up, cable TV, water and sewage hook-up. Coin-operated hot showers and laundry are also available. Reservations (highly recommended April through October) are available up to 13 months in advance. Desert View is the South Rim’s best campground if you’d like to be close to the rim. This first-come, first-served campground is located 26 miles east of Grand Canyon Village, near the South Rim’s East Entrance Station. Although it lies at an elevation of 7,463 feet (2,275 meters), 492 feet higher than Mather Campground, it experiences a warmer climate thanks to its close proximity to the rim. As warm air drifts up from the inner Canyon it flows over the rim, resulting in an arid landscape dominated by juniper trees and pinyon pines. The best part about Desert View Campground: its proximity to Desert View, one of the most spectacular viewpoints on the South Rim. That said, the campground’s far-flung location isn’t ideal if you want to be close to all the restaurants and activities in Grand Canyon Village. If Mather Campground and Trailer Village are full, however, the 50 campsites at Desert View Campground are your only other option for Grand Canyon camping on the South Rim. Be aware that the campground often fills up in the early afternoon. Each campsite accommodates up to six people, three tents and two vehicles or one RV. Maximum RV length (vehicle + trailer): 30 feet. No showers, laundry or RV hook-ups. For additional info on South Rim camping, visit Grand Canyon’s official website. Grand Canyon’s best campgrounds are often full in June, July and August. Fortunately, there are several great campgrounds near Grand Canyon’s South Rim, just outside the national park. This private campground is located in the small town of Tusayan, 1.5 miles south of Grand Canyon’s South Entrance. It features roughly 150 RV campsites (some full hook-up, some water and electricity only) and 20 tent-only campsites. Reservations are available for RV sites, but tent campsites are first-come, first-served. Coin-operated laundry and showers are available. Note: from Memorial Day through Labor Day, Grand Canyon National Park’s free shuttle bus makes regular trips between Tusayan and the park. Located two miles south of Tusayan in the Kaibab National Forest, the Ten X Campground lies four miles south of Grand Canyon’s South Entrance in the Kaibab National Forest. This makes it your best bet for a low-cost public campground near Grand Canyon National Park’s South Rim. The campground, which is situated in a ponderosa forest at 6,600 feet (2,012 meters), has 70 campsites. Reservations are available for 22 of the campsites. The remaining 48 campsites are first-come, first served. No showers, laundry or RV hook-ups. Maximum vehicle length: 35 feet. Although staying at this historic cabin isn’t exactly “camping,” it’s rustic enough to belong on this page. Built in the late 1880s as part of a sheep ranch, Hull Cabin is the oldest surviving historic cabin near the Grand Canyon’s South Rim. It is located in the Kaibab National Forest less than one mile (1.6 kilometers) from Grand Canyon’s South Rim. The cabin sleeps up to six and comes with a fully equipped kitchen. No electricity. Reservations can be made up to six months in advance. Elevation: 6,500 feet (1,980 meters).